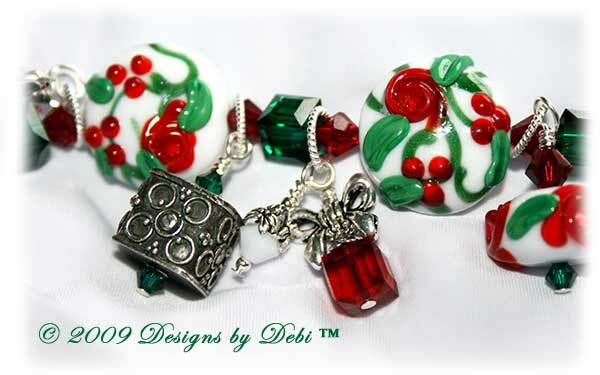 I began this piece with some festive artisan lampwork beads handmade by Mary Bush of Honey Bear Beads. 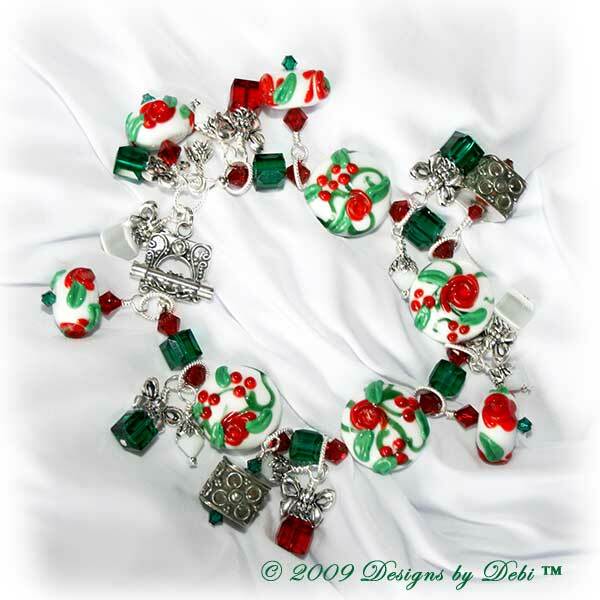 These include lentil beads with red roses, holly berries, green leaves and green scrolls layered atop a snow white base along with the matching red rose rondelles. 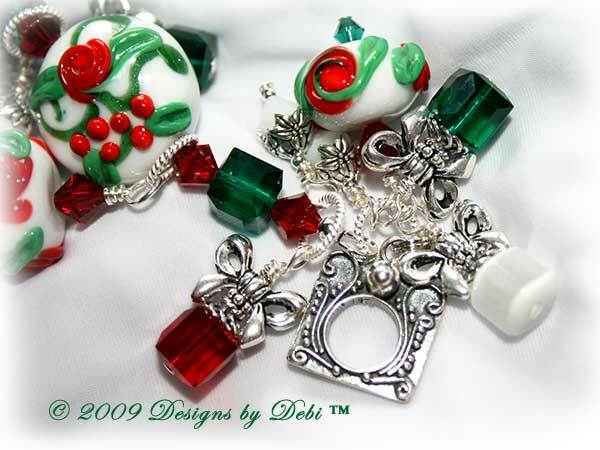 Fine silver cube beads, bead caps and a toggle handmade by silversmiths in Bali, Indonesia complement her beads beautifully. 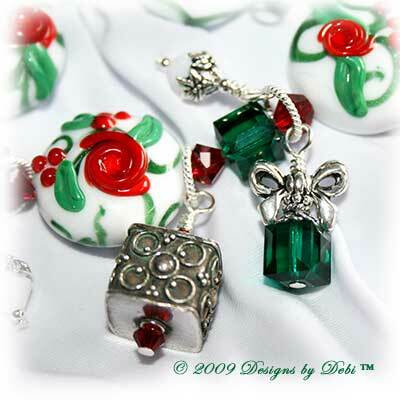 Swarovski® crystal cubes and bicones in emerald, siam and white alabaster are used throughout the piece. 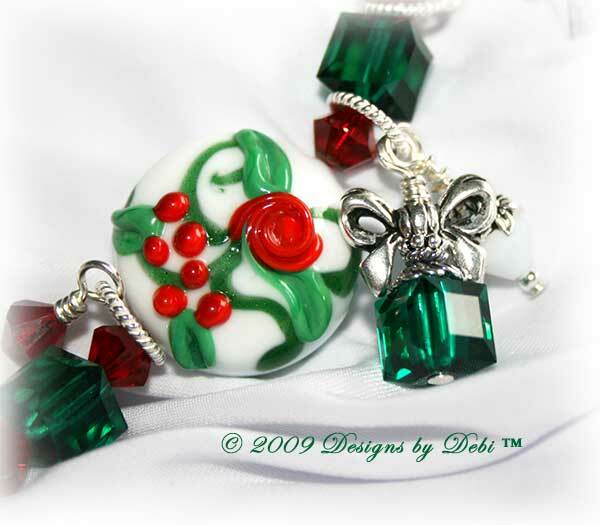 Emerald and siam crystal and white cat's eye cubes were used along with TierraCast® bow beads to make the present charms that hang cheerily from twisted jump rings. Look closely and you'll notice small pointsettia bead caps on the white alabaster bicones dangling along the length of the bracelet. 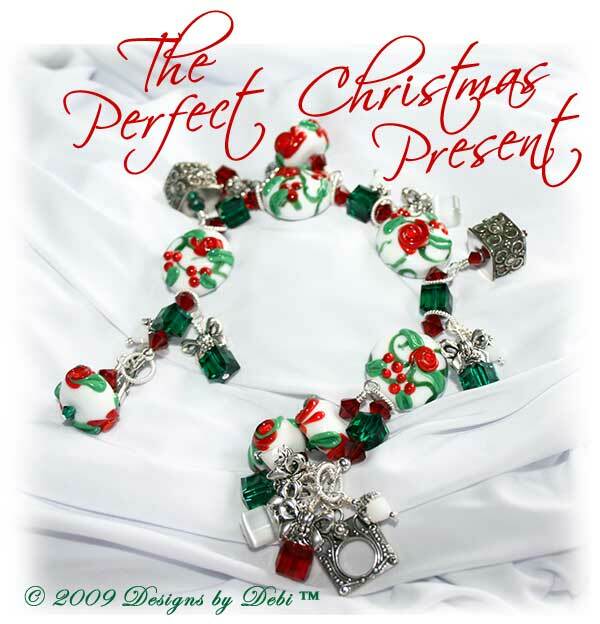 All together...a perfect holiday treasure sure to bring lots of Christmas cheer! The charity I've selected to receive the donation from this piece is the Aplastic Anemia Foundation. December is Aplastic Anemia Awareness Month. I've chosen this charity because my best friend's daughter, Kailey, has aplastic anemia. She and her family, along with millions of others, live with the daily challenges and serious health scares that it brings. When you have a child afflicted with a disease resulting in life-threatening situations on a regular basis, you truly come to realize what a precious gift life is and you are grateful for every day. Aplastic anemia, diagnosed most frequently in children and young adults, is a bone marrow failure disease occuring when bone marrow doesn't make enough blood-forming stem cells. The treatment is stem cell transplantation for those having a matched sibling donor; and immunosuppressive therapy for those who do not. The disease presents an ongoing challenge for those affected and their families. The Aplastic Anemia and MDS International Foundation, Inc. has been fighting bone marrow failure diseases through patient support and research since 1983. To find out more about the Aplastic Anemia and MDS Foundation or to make a donation on your own, go to www.aamds.org. The bracelet measures 8 3/4 inches and will fit a 6 1/4 inch (very loosely) to 7 inch wrist. If you need the bracelet re-sized, please let me know at time of purchase and this can be done prior to shipment at no additional charge.